I've been a fan of Anne Byrn since her first Cake Mix Doctor came out and have bought every cookbook of hers that I could find (they're all excellent except for the Dinner Doctor book which I didn't love) and pretty much every birthday around here involves a Cake Mix Doctor cake. 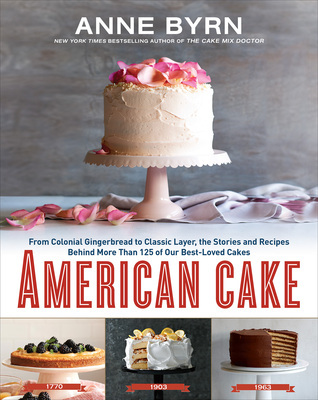 So when I saw she had a new book out called American Cake: From Colonial Gingerbread to Classic Layer, the Stories and Recipes Behind More Than 125 of Our Best Loved Cakes I knew I was going to have to have it! As luck would have it just as I was about to order it sight unseen my library happened to have it displayed on the endcap. So of course into the check out bag it goes! Part history book part cookbook this doesn't disappoint. Unlike Byrn's other cookbooks this one consists almost entirely of from scratch recipes and while technically all cakes there is a lot of variety! I also enjoyed that instead of being separated by type of cake the recipes are separated into date ranges. The first is 1650 to 1799: Baking Cakes in Early America and goes all the way up to 2000 to The Present: The Cakes of the New Millennium.. There's also the usual chapter on ingredients and tools but even here there is quite a bit of history on the evolution of the tools and the ingredients that are used in most baking. Each chapter begins with a 1 or 2 introduction about the time period regarding what was happening in general as well as what was popular and available in the baking world. Sprinkled through out are little inserts that provide information on original tools or other important events as well as trivia regarding historical figures. If you ever wanted to know just what cake Grover Cleveland preferred or just whose favorite dessert was Pork Apple Pie (though it doesn't tell me what exactly Pork Apple Pie is) than this is a cookbook you would enjoy. A number of presidential favorites are featured in the book so if you want to have an election night party perhaps Martha Washington Great Cake (George Washington), Blackberry Jam Cake (Andrew Jackson), or The Lane Cake (Jimmy Carter) would be the perfect desserts! As for me I think I'll be baking Malinda Russell's Washington Cake. This recipe was originally published in 1866 in a pamphlet called A Domestic Cookbook. It is the first cookbook authored by an African American woman and contains not only recipes but first person stories (and I'll be trying to track down a copy as soon as I finish the cake!). Malinda Russell herself sounds like a fascinating woman. She was ran a boardinghouse and pastry shop in and took a cosmopolitan approach to typical soul food by adding things like brandy, rosewater, spices, and almonds. The book states that she was raised in East Tennessee and taught to cook by a Virginia slave named Fanny Steward. The cake is English in style and is thought to have once been called a Queen's Cake. Of course after the Revolution was renamed Washington Cake. Now with a story like that how can you resist this cake? Place a rack in the center of the oven, and preheat the oven to 325. Lightly grease and flour a 10" tube pan, and shake out the excess flour. Set the pan aside. Place the butter in a large mixing bowl, and beat with an electric mixer on low speed until creamy, 1 minute. While the mixer is running, gradually add the sugar and beat until light and creamy, 2 minutes. Scrape the sides of the bowl with a rubber spatula. Add the pinch of salt, if desired, and add the eggs, one at a time, beating on low speed until each egg is incorporated, about 15 seconds each. Turn off mixer. Stir the baking soda into the cup of sour milk. 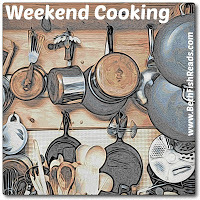 Place the flour in a large mixing bowl, and stir in the cream of tartar. Alternately add the flour, and milk to the egg mixture, beginning and ending with the flour and mixing on low speed until smooth. Fold the lemon juice and zest into the batter. Turn the batter into the prepared pan, and place the pan in the oven. Bake the cake upntil the top is golden brown and a toothpick inserted in the center comes out clean, 1 hour 15 to 20 minutes. Remove the pan from the oven, and place the pan on a wire rack to cool for 20 minutes. Run a knife around the edges of the pan, give the pan a gentle shake, then invert the cake once and then again onto the rack to cool completely, 1 hour. Slice and serve. There's lots of other info around the recipe including how she decoded the original 1866 directions into something that would work for here and now. While originally this was a library checkout I did go on an order myself a copy. It's definitely a book I'm excited to cook from. I love getting a little history with my desserts! Oh wow. This is definitely my kind of book -- a little history mixed with good recipes I hope my library has a copy. I hope they do! I think you'd enjoy it. You've convinced me -- I want the book! I gave my sister one of the cake doctor books and she loved it, though I haven't baked any of them myself. Still, I think of myself as a fan, and that is a really great way to approach the history of cakes. Thanks for the really fascinating review! Oh thank you! Her cake mix books are so reliably good but this book was really different and so interesting! Awesome! I'll be exploring this later! Thanks! Right! Not sure there's anything better than a lemon, butter, sugar combo! There are a lot of really simple but delicious recipes here and they all have stories! Love food history mixed with recipes -- and nice that the book is divided by time rather than type of cake. Will look for this at the library. Thanks! I think you'd enjoy it. This was definitely 2 of my favorites things combined! I will as soon as it gets made! I'm salivating over this post. I've been on Weightwatchers program for a couple of months now and get lots to eat - but I find I crave my sweet carbs, and some nights would punch somebody for a slice of cake! Sweet carbs are definitely my downfall! A piece of cake now and then won't hurt anything - my problem is I tend to want to eat the whole cake! I love history and cookbooks so this one is a winner for me. I really liked it and am really excited about cooking my way through it. I used to bake a lot but since my kids are grown I rarely bake any more. My daughter loves to bake and would love this book! Make sure you borrow it to flip through it! The history is fascinating. The food history was fascinating and I'm hoping to cook my way through this one. I'm with you on gardening too. I love stories of heirloom roses and tomatoes - pretty much anything with lots of variety! 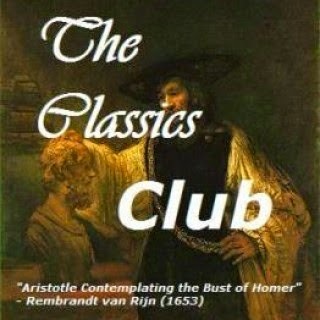 I'd buy it based on the cover alone but now I want to see if my library has a copy and then maybe order my own. Thanks for telling us about it! I love the cover too! I like that they're pretty but not super decorated. I linked this on Bumbershoot's.